The warmest season of the year can be the best time to go on a relaxing vacation. However, as many holidayers choose to go on an island as their preferred getaway, this is your opportunity to opt for a European city holiday. With a variety of cities and experiences to choose from – from mellowing out on a bright beach to wandering through lush gardens and exploring air-conditioned museums and shady historical landmarks – planning a vacation in a metropolitan setting during the humid months can turn out to be a unique and memorable alternative for your summer vacation. Click here to explore more of this penthouse. With huge windows and a gorgeous outdoor terrace, our local interior designer has captured Tel Aviv’s summery atmosphere. Between four plush bedrooms and additional sofa beds, this apartment can accommodate up to 11 guests. Spacious interiors give you plenty of room to breathe, and funky wall art adds a unique touch. This apartment is only a 15-minute walk from the beach, and the popular Carmel Market is right around the corner from this beauty. Go to the beach, or grab yourself a freshly squeezed fruit juice and relax in that gorgeous garden of yours. Check out more from this beach apartment get away. Inspired by the bold colors and clean lines of modern art, our local interior designer has filled this duplex apartment with youthful energy. Plush red couches pop against the black-and-white palette, and huge windows let in plenty of light. 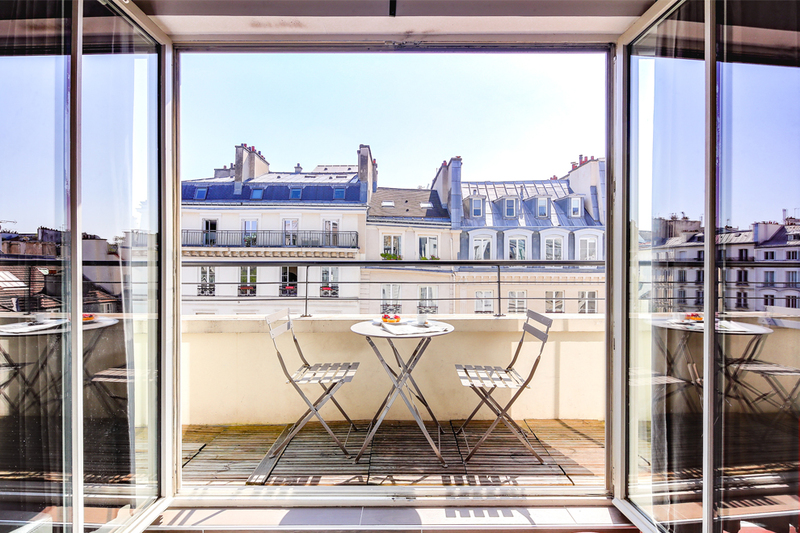 This funky apartment is your invitation to explore Paris, even in the summer, with a bijoux balcony to enjoy a nice cold French Rosé. Delve more into this chic apartment here. This 3-bedroom vacation apartment in Barcelona is located in the sweet seaside neighborhood of Poble Nou. Only a short stroll away from the sea, you can take surfing lessons, eat at one of the many seaside restaurants, or lounge on the sunny beaches. Our local interior designer has decorated this apartment to capture the sunny, laid-back vibe of the local beaches and with the added cherry on top: the spacious balcony overlooks the sea, where you can eat your breakfast and plan your outdoor activities for the day. Dig more into this beachside vacation apartment here. This rustic apartment in Jerusalem has been refurbished by our local interior designer to make you feel at home in the city. Located in Jerusalem’s quiet German Colony neighborhood, the modern 2-bedroom Avishai vacation apartment gives you Middle Eastern flavor in an ideal location. Only minutes away from the apartment, you’ll find upscale restaurants, shops, and the best coffee in the city on Emek Refaim Street. Meet some local friends and invite them for a dinner in your sweet back garden, that can fit easily up to 10 people. Discover more of this beautiful garden vacation apartment. Chic yet comfortable, the 2-bedroom Fitzrovia Terrace II vacation apartment immerses you in British charm. In this lively neighborhood, made famous by poets, musicians, and dreamers, you’ll find authentic restaurants and fabulous art galleries. This sleek apartment has been decorated by our local interior designer to make you feel at home. A huge loft-style picture window lights up the living room, and London-themed wall art brings the city indoors, and our favorite feature is the cozy balcony overlooking the neighborhood’s quaint brick buildings. Look out for more amazing shots from this vacation apartment. With a fresh, modern twist on Belgium decor, our local interior designer has created an ideal spot for your family getaway. Each room is wide and sunlit, and decorative accents such as rustic stone tiling give character to the space. Located In the quiet and relaxing Flagey neighborhood, this vacation apartment is a great base for seeing Brussels. Home to writers, artists, and intellectuals, Flagey’s local sidewalk cafes and bookshops are not to be missed. Check out more from this incredible apartment here. There’s still time to enjoy the rest of your summer! Book your last minute vacation apartment now.